Chandigarh: The Haryana government today said it will launch the Ayushman Bharat-Haryana Health Protection Mission on August 15 to provide cashless healthcare facilities to beneficiaries at empanelled hospitals. On a pilot basis, the scheme would be implemented in one government hospital in each of the 22 districts, one ESI hospital and one medical college. 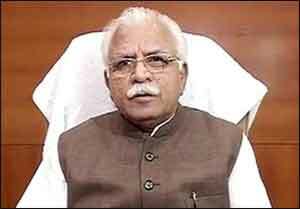 A decision to this effect was taken in a meeting held under the chairmanship of Chief Minister Manohar Lal Khattar here , an official release said. Every family figuring in the defined SECC 2011 database would be entitled to claim benefits under the scheme. Each beneficiary would be issued a card with a unique QR code and he/she would have to produce it at the hospital. The chief minister directed the hospitals to stock up on medicines so that patients did not need to purchase them from outside. It was informed that all necessary arrangements have been made for the pilot launch of the Ayushman Bharat-Haryana Health Protection Mission in the State. A total of 15.50 lakhs families, including 9,25,014 in rural and 6,26,761 in urban areas, that figure in the SECC-2011 database would be entitled to claim the benefits, the release said. It said 58 government and 32 private hospitals in the state would be empanelled for successful implementation of the scheme by August 15 for the pilot project. Work is in progress to empanel more hospitals. Out of 1,350 treatment packages provided by the government of India, about 266 packages would be reserved by the state government for the public healthcare system in government hospitals of the state, the statement said. The Department of Medical Education and Research has been asked to empanel the medical colleges or hospitals in the Ayushman Bharat Scheme. Similarly, the Labour department has been asked to empanel the ESI Medical College and hospitals under the scheme. The release said Ayush Mitras would be appointed in all empanelled government hospitals to assist patients in availing the facilities under the scheme. Earlier, the chief minister also launched the website of the Ayushman Bharat-Haryana Health Protection Mission. 1350 PACKAGES BY THE CENTRAL GOVERNMENT 226 TREATMENT PACKAGES MEANS WHAT ?. TREATMENT WITH OUT RIGHT DIAGNOSIS IS NOTHING BUT A DISASTER. IN MAJORITY OF THE GOVERNMENT HOSPITALS MOST OF PATIENTS ARE PACKED UP / SENT BACK EVEN TOUCHING THEM ,, MOST OFTEN THEY SCRIBBLE SOME VAGUE DIAGNOSIS OF THEIR CHOICE – GBP- GENERALIZED BODY PAIN ( GOK – GOD ONLY KNOWS) . AS A TREATMENT Ink Diclofenac, Tab – Diclofenac bdx 3days. Tab BC/ mb of x 3dsys. Coming to INVESTIGATIONS – CBC, URINE ROUTINE, USG -ABD, X -RAY OF THE PART, ECG . ALMOST SAME THING REPEATS FOR ALL MOST ALL THE PATIENTS. MOST OFTEN THE VISIT IS LIKE A TEMPLE VISIT -BANG THE BELL, BOW BEFORE THE DIATY , TAKE THE ARTHI AND PRASD ( Which is same for all, unless you\’re a vip), go back home). DUE TO THIS TYPE OF MEDICAL CARE , WE ARE HAVING WORLD\’S HIGHEST NUMBER OF UNDERNOURISHED CHILDREN, TUBERCULOSIS PATIENTS, CHILDREN WITH STUNTED GROWTH, WOMEN WITH ANEMIA , CHILDREN BORN UNDERWEIGHT , WORLD HIGHEST NUMBER OF UNDETECTED MENTAL DISORDERS, IMPROPER, IRREGULAR , INAPPROPRIATE TREATMENT FOR THE HYPERTENSION, DIABETES, HEART, KIDNEY, LIVER AND LUNG And OTHER DEGERATIVE JOINTAND AGE RELEATED DISORDERS . IT Takes minimum of 10 minutes to examine a PATIENT. In our country in 10 minutes more than 10 PATIENTS are disposed from the clinics. IF SIMILAR PRACTICE IS ADOPTED BY OUR COURTS , THE LONG PENDING CASES – MORE THAN 30000000 / 3CRORE , WHICH ARE LIKELY TO TAKE 300 HUNDRED YEARS, CAN BE DISPOSED WITH IN 3 MONTHS OR 3 YEARS. I HOPE NOW , WE UNDERSTAND WHAT KIND OF HEALTH CARE SYSTEM WE ARE IN , AND TYPE OF TREATMENT IS MORE DANGEROUS THAN THE ILLNESS ITSELF. AS LONG AS ILLTRAINED , IDIOTIC TYPES OF ADMISSTRATERS , SPECIALLY THE BABUS THE BUREAUCRATES ARE MADE TO HEAD MEDICAL EDUCATION AND HEALTH CARE SYSTEM CAN NOT (never) IMPROVE , RATHER MORE LIKELY TO DETORIATE.BEFORE . LET ME ASK ,TO SHOW ANY TEACHING MEDICAL COLLEGE HOSPITAL IN INDIA FOLLOWING I C D system in true sense ( honestly). IT LOOKS TO THE LAWMAKERS / POLITICIANS ARE CONCERN ABOUT IN IMPROVEMENT OF THE HEALTH CARE SYSTEM AND MEDICAL EDUCATION , UNFORTUNATELY , THEY ARE OVERDEPENDANT ON THE NON PROFESSIONAL and UNSCIENTIFIC BABUS, THAT IS THE MAIN RESION FOR FAILURE OF OUR GOVERNMENT POLICIES. ( ALMOST ALL ). It’s very easy find fault and put allegations about Indian health care system. You must be one of those, who failed to get through Indian medical colleges. It shows your frustration, if you are really true Indian, you will not find fault, rather you work toward helping Indian patients.